NEW YORK March 18, 2019; An expedition supported by INFINITI Motor Company won one of the most prestigious honors in global exploration at the 115th Explorers Club Annual Dinner in New York. The award recognized the scientific breakthrough of an expedition to the Gobi desert in 2018 that, for the first time, applied NASA imaging technology to improve the science of finding dinosaur fossils. The expedition, dubbed The Roy Chapman Andrews Centennial Expedition, was organized by the Club's Hong Kong Chapter and was awarded the Club's prestigious Citation of Merit in recognition of an outstanding feat of exploration. Roy Chapman Andrews famously found dinosaur eggs at the Flaming Cliffs in the Gobi approximately 100 years ago and was the first explorer to use "motor cars" to vastly increase the efficiency of the expedition. A century later, INFINITI provided a fleet of state-of-the-art luxury SUVs and underwriting to support the expedition, reinforcing the ethos of using new technology to empower exploration. Michael Barth, Founder and Chair of The Explorers Club Hong Kong Chapter (ECAD), said, "We are humbled and thrilled that the power of our 'Collaboration Over Conquest' approach to exploration is being recognized by our illustrious group of peers with this year's Citation of Merit. We are looking forward with renewed purpose to leading upcoming expeditions in the Chapter's pipeline that are as equally inclusive, innovating and impactful as the Roy Chapman Andrews Centennial Expedition. INFINITI supported this idea from day one and has been an invaluable partner for the Explorers Club Hong Kong Chapter." Since the Citation of Merit was first awarded in 1962, very few awards have ever been shared by an entire team, the first of which was the American Mount Everest Expedition of 1963. Other awardees have included Naomi Uemura, the first person to reach the North Pole solo; Robert Ballard, the oceanographer who discovered the Titanic; Susan Shaw, a marine toxicologist who was the first scientist to show that chemicals used in consumer products contaminate marine mammals; and Merle G. Robertson, an artist, archaeologist and art historian who devoted her life to preserving the culture of the Ancient Maya. This year's Explorers Club Annual Dinner celebrated the 50th anniversary of the Apollo 11 lunar landing in July 20, 1969. "INFINITI understands exploration and the mission of the Explorers Club. Through their brand ethos, products and technology, INFINITI is striving to push dragons off maps just like the Club. We are grateful for the support of INFINITI for the 115th ECAD and appreciate the deep relationship with our Hong Kong chapter," said Richard C. Wiese, president of the Explorers Club. 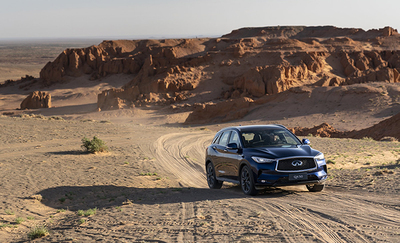 Among the SUV's INFINITI provided were its all-new QX50 mid-size luxury crossover, which features the world's first production variable compression engine; the capable, comfortable and contemporary QX80 full size SUV that traversed the Gobi with ease; and the full size QX60 three-row SUV. "At INFINITI, we share the same insatiable curiosity and desire to push ourselves further, using new technology to go beyond what was previously thought possible," said Trevor C. Hale, general manager, INFINITI global communications, and member of the winning expedition. 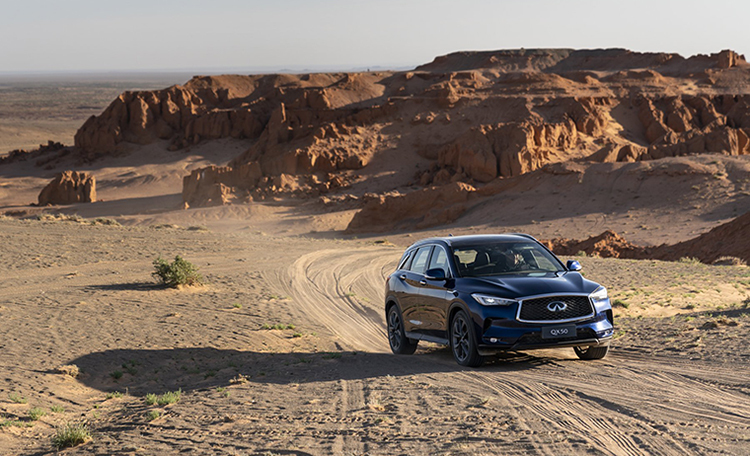 "There is such a compelling sense of history and symmetry in empowering an expedition a century after Roy Chapman Andrews, with a fleet of state-of-the-art INFINITI SUVs and new technology." INFINITI Motor Company Ltd. is headquartered in Hong Kong with representations in markets around the world. The INFINITI brand was launched in 1989. Its range of luxury automobiles is currently built in manufacturing facilities in Japan, North America and China. INFINITI design studios are located in Atsugi-Shi near Yokohama, London, San Diego and Beijing. INFINITI will electrify its entire lineup from 2021 onward. The brand has been widely acclaimed for its daring design and world's first driver-assistance technologies. From the 2016 season, INFINITI is a technical partner of the Renault Sport Formula One team, contributing its expertise in hybrid performance. The primary purpose of the Institute of Paleontology and Geology (IPG) is to conduct world- class research and promote the extraordinary paleontological and geological resources of Mongolia. The aim of the IPG is to develop in-depth research on the ancient organisms of Mongolia (paleontology, evolution and biostratigraphy), and, mineralization and geology of the Kherlen and Onon regions. The team consists of 82 team staff including researchers and administration. The Explorers Club is an international multidisciplinary professional society dedicated to the advancement of field research and the ideal that it is vital to preserve the instinct to explore. Since its inception in 1904, the Club has served as a meeting point and unifying force for explorers and scientists worldwide. Founded in New York City in 1904, The Explorers Club promotes the scientific exploration of land, sea, air, and space by supporting research and education in the physical, natural and biological sciences. The Club's members have been responsible for an illustrious series of famous firsts: First to the North Pole, first to the South Pole, first to the summit of Mount Everest, first to the deepest point in the ocean, first to the surface of the moon—all accomplished by our members. The Hong Kong chapter was formed in 2014 to promote the values and work of The Explorers Club in the region, and to make Hong Kong the platform for a new era of exploration of Asia and beyond. For more information about The Explorers Club Hong Kong Chapter go to https://explorershk.org or follow us on Instagram, Facebook and Twitter. From the Roy Chapman Andrews Society: https://roychapmanandrewssociety.org/roy- chapman-andrews/ "Roy Chapman Andrews gained national fame as an explorer for the American Museum of Natural History in New York City. He began his career at the museum in 1906 by sweeping floors and assisting in the taxidermy department. By 1934 he had become the museum's director. Andrews is best remembered for the series of dramatic expeditions he led to the Gobi of Mongolia from 1922 to 1930. Andrews took a team of scientists into previously unexplored parts of the desert using some of the region's first automobiles with extra supplies transported by camel caravan. Andrews – for whom adventure and narrow escapes from death were a staple of exploring – is said to have served as inspiration for the Hollywood character "Indiana Jones." Andrews's expeditions to the Gobi remain significant for, among other discoveries, their finds of the first nests of dinosaur eggs, new species of dinosaurs, and the fossils of early mammals that co-existed with dinosaurs. These materials remain the subject of exhibits and study, and they inspired a new wave of exploration in the Gobi by the American Museum beginning in 1990."